November 23,1995 Bugatti at Tokyo Motor Show! Despite the fact that Bugatti is Bankrupt, they had a stand at the 31st Tokyo Motor Show, which was held from October 28 to November 8. Bugatti Automobili Spa, Italy, has been declared bankrupt, with a total debt of 200 million! This is a daughter of Bugatti International of Luxemburg. So this part of the business that sells the "name' through luxury goods will probably continue. If Bugatti Automobili can be resurrected in future, we'll see...... They could have a good chance, if they manage to complete the EB112, which will obviously sell much better than the supercar EB110. What the consequences are for Lotus, who recently made a new model, the Elise, introduced by Bugatti president Romano Artioli at the recent IAA in Frankfurt, is unknown. Lotus is owned by Bugatti International in Luxemburg, and Romano Artioli (President of Bugatti International) is not willing to sell Lotus, and can't be forced either, to pay the debts of Bugatti Automobili. In between Bugatti International and Lotus are a few more holdings as well. Lotus appears to do quite well, even making a profit, especially on their Engineering department. 1 Type 35, chassis #4777. Owned by retired Admiral Scott Ebert of Florida. In the race itself, Phil Hill drove the 54 GP car to a convincing win over Steve Meyer's T51 which was on alcohol. 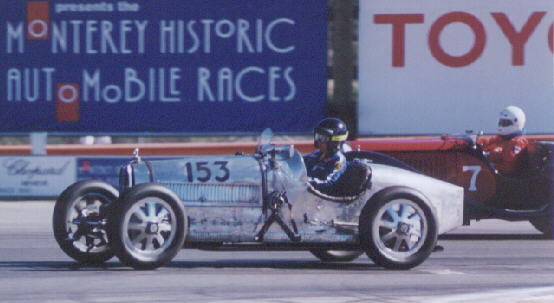 Peter Giddings drove a borrowed T35C to third. Most of the Bugattis ran well and there was little attrition, showing good preparation. Also present was the recreation of the 1923 Voisin Laboratoire that ran at the French GP against the 1923 Bugatti T32 "TANK" . These two cars circled the track together in the first race offering a good photo oportunity. At Pebble Beach Concours, in addition to many of the above that were on display, there was also a gorgeous Type 57SC Atalante and an overdecorated Type 51 GP car from the Nethercutt collection. Furthermore the modern 1995 EB110 Super Sport was present, while a EB112 was present at the Pebble Beach event. removed 14-11-95 The current issue of Superclassics, a British quarterly magazine features a small article about the Bugatti 251, in their Famous Failures series! Bugatti importer in the Netherlands!! If you are interested, I can make the contact if you like. removed 7-6-95 Recently Bugatti sold Lotus, which it had bought just a year ago. Problems with the payment of the development of the EB112 probably caused this. The EB112 is a four seater, four wheel drive luxury car, powered by the EB110 engine, modified to 5 liters, but without the 4 turbochargers. Development of the body was stopped by Giugiaro's Italdesign, because Bugatti couldn't pay in time. 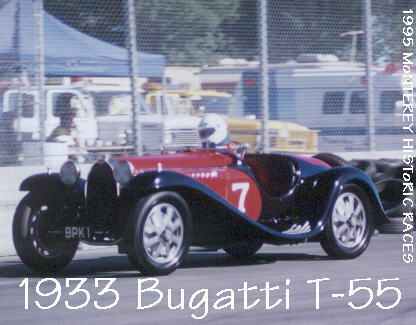 removed 7-6-95 It also seems that Bugatti is looking for a big investor, maybe Mercedes. Grand opening of the Ettore Bugatti boutique in Hawaii. It will be the EB's introduction to the U.S. market (the boutiques are currently in Milan, Paris, and Tokyo). An EB110 will be on display and the boutique will carry all of the EB collection. The next issue of Auto Motor und Sport, a German magazine (no.16, beginning of August) will have an article about the Bugatti Atlantic, more exactly about a Danish chap, who makes replicas of them! 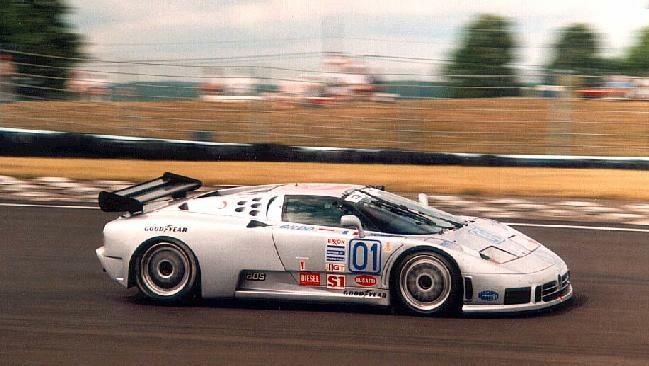 June 25, 1995 Bugatti fifth at Watkins Glen! The Bugatti EB110, in its North American debut, finished fifth in the GTS-1 class. Former Formula One driver Patrick Tambay and Gildo Pastor-Pallanca wheeled the car to the checkered flag five laps behind class winner Hoerr. In qualifying Former Formula One and Can-Am driver Patrick Tambay, with Gildo Pallanca-Pastor, rolled out the Bugatti EB110 SS for its North American debut. The GTS-1 class racer was 24th fastest overall, 10th in class. Information from Motorsport News International, with the latest news about the IMSA class GTS-1 in which the Bugatti competes available. It seems that the financial problems of Bugatti have come to an end for the moment. An investor from India (Rao??) has invested 100 billion Lira. With this transaction it seems that the power over the Bugatti company has moved from Italy. The transaction was just in time, as some 20 suppliers has asked for bankruptcy of Bugatti, because of failure to pay their debts. This notice comes from british magazine Car, can anyone confirm this? Also more details are very welcome!! -- Bugatti's ill-fated attempt to sell its recently acquired Lotus subsidiary to the investment group 21 Invest has been scrapped. After agreeing to buy Lotus in March for $52 million, the group lowered its offer by a reported 25 percent and Bugatti said bye-bye. Bugatti management is now offering a minority share in the holding company that controls both Bugatti and Lotus and Bugatti chairman Romano Artioli said he is having talks with at least three European groups. This is the second setback in six months for Bugatti, which announced a buyer late last fall only to see that offer fall apart in January. A public stock offering proposal also failed for the cash-strapped automaker. Meanwhile, production of the Bugatti EB110 is on hold despite $1.5 million in pre-paid orders for 16 EB110s ticketed for U.S. dealers.